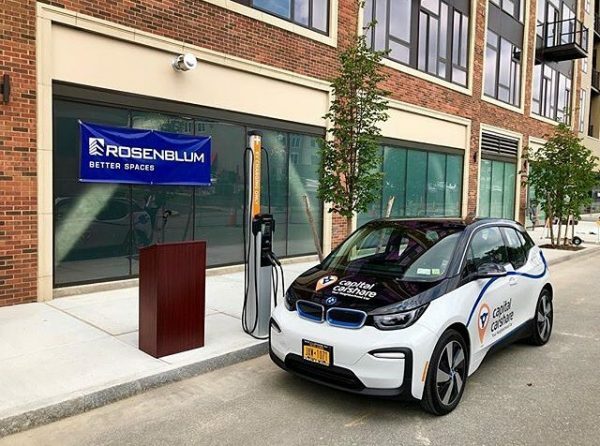 The Rosenblum Companies has partnered with Capital CarShare, an Albany-based carsharing non-profit, to provide CarShare’s first electric plug-in vehicle, a BMW i3. The BMW i3 is a zero emissions vehicle that has a range of up to 114 miles with a full charge. Capital CarShare provides access to shared vehicles and promotes the use of other shared modes of transportation, such as riding transit, walking and biking to reduce the negative environmental and economic impacts of driving gasoline powered vehicles. This BMW i3 marks the eleventh car in Capital CarShare’s fleet. BMW North America donated an electric charging station, which has been placed on Sixth Avenue outside The News Apartments, TRC’s $23+ million mixed-use apartment project. TRC is providing free power. As part of the partnership, residents of The News Apartments will be able to utilize CarShare vehicles at a discounted rate. Other environmentally friendly features and amenities offered at The News include geothermal heating and cooling, smart thermostats, LED lighting, ENERGY STAR® appliances, and heated indoor bicycle storage. The News also has a Walk Score of “94”; Walk Score is a public access index that assigns a numerical “walkability” score from 0 – 100 to any address in the United States. “Getting infrastructure for electric vehicles can be extremely difficult, but when all parties work together it accomplishes great things. Adding a zero emission vehicle to our fleet will continue to reduce the capital region’s carbon footprint while increasing the amount of people who can utilize our services,” said Melanie Beam, executive director of Capital CarShare. “The City of Troy is thrilled to have an electric car charging station right in our downtown. This environmentally progressive initiative goes hand in hand with the strides that we are taking as a city to decrease our carbon footprint, and we look forward to further partnering with organizations such as Capital CarShare,” said Patrick Madden, Mayor of Troy. “I’m pleased to partner with the Rosenblum Companies on this innovative energy efficient car sharing program. This continues our city’s efforts in protecting and promoting our environmental protection and stewardship,” said Troy City Council President Carmella Mantello. The News Apartments combines a historically sensitive adaptive renovation of the century-old Troy Record building with a complementary new addition. Preleasing of apartments began earlier this year and residents began moving in May 2018. Studio, one- and two-bedroom units offer such unique features as dens, balconies, terraces and walk-in closets. All units are outfitted with full-size washers and dryers, oversized windows, quartz counter tops, and premium stainless-steel appliances. In addition to the amenities mentioned above, residents have access to a 24-hour fitness center, sky deck with gas fire pit and grilling station, private coworking space, sports and game lounge, pet spa and available onsite parking. To learn more about Capital CarShare, visit capitalcarshare.org or call (518) 545-4740.